<activity android android android android android android android android android android android android android android android android android android android android android iallowTaskReparenting=r"true" | "false"] i alwaysRetainTaskState=r"true" | "false"] iclearTaskOnLaunch=r"true"" | "false"] iconfigChanges=rone or more of: "mcc" "mnc" "locale"
"singleTask" | "singlelnstance"] imultiprocess=r"true" | "false"] i name="string"
inoHistory=r"true" | "false"] ipermission="string" iprocess="string"
"landscape" | "portrait" | "sensor" | "nonsensor"] i stateNotNeeded=["true" | "false"] i taskAffinity="string" itheme="resource or theme"
iwindowSoftInputMode=rone or more of: "stateUnspecified"
Whether or not all activities will be removed from the task, except for the root activity, whenever it is relaunched from the home screen — "true" if the task is always stripped down to its root activity, and "false" if not. The default value is "false". This attribute is meaningful only for activities that start a new task (the root activity); it's ignored for all other activities in the task. When the value is "true", every time users start the task again, they are brought to its root activity, regardless of what they were last doing in the task and regardless of whether they used BACK or HOME to last leave it. When the value is "false", the task may be cleared of activities in some situations (see the alwaysRetainTaskState attribute), but not always. Lists configuration changes that the activity will handle itself. When changes that are not listed occur, the activity is shut down and restarted. When a listed change occurs, the activity remains running and its onConfigurationChanged() method is called. The IMSI mobile country code (MCC) has changed — that is, a SIM has been detected and updated the MCC. The IMSI mobile network code (MNC) has changed — that is, a SIM has been detected and updated the MNC. The locale has changed — for example, the user has selected a new language that text should be displayed in. The keyboard accessibility has changed — for example, the user has slid the keyboard out to expose it. The screen orientation has changed — that is, the user has rotated the device. The font scaling factor has changed — that is, the user has selected a new global font size. All of these configuration changes can impact the resource values seen by the application. Therefore, when onConfigurationChangedn is called, it will generally be necessary to again retrieve all resources (including view layouts, drawables, and so on) to correctly handle the change. Whether or not the activity should be excluded from the list of recently launched activities that can be displayed to users — "true" if it should be excluded, and "false" if it should be included. The default value is "false". Whether or not the activity can be launched by components of other applications — "true" if it can be, and "false" if not. If "false", the activity can be launched only by components of the same application or applications with the same user ID. The default value depends on whether the activity contains intent filters. The absence of any filters means that the activity can be invoked only by specifying its exact class name. This implies that the activity is intended only for application-internal use (since others would not know the class name). So in this case, the default value is "false". On the other hand, the presence of at least one filter implies that the activity is intended for external use, so the default value is "true". An icon representing the activity. The icon is displayed to users when a representation of the activity is required on-screen. For example, icons for activities that initiate tasks are displayed in the launcher window. The icon is often accompanied by a label (see the label attribute). The modes fall into two main groups, with "standard" and "singleTop" activities on one side, and "singleTask" and "singleInstance" activities on the other. An activity with the "standard" or "singleTop" launch mode can be instantiated multiple times. The instances can belong to any task and can be located anywhere in the activity stack. Typically, they're launched into the task that called startActivity() (unless the Intent object contains a flag_activity_new_task instruction, in which case a different task is chosen — see the taskAffinity attribute). The "standard" and "singleTop" modes differ from each other in just one respect: Every time there's new intent for a "standard" activity, a new instance of the class is created to respond to that intent. Each instance handles a single intent. Similarly, a new instance of a "singleTop" activity may also be created to handle a new intent. However, if the target task already has an existing instance of the activity at the top of its stack, that instance will receive the new intent (in an onNewIntent() call); a new instance is not created. In other circumstances — for example, if an existing instance of the "singleTop" activity is in the target task, but not at the top of the stack, or if it's at the top of a stack, but not in the target task — a new instance would be created and pushed on the stack. The "singleTask" and "singleInstance" modes also differ from each other in only one respect: A "singleTask" activity allows other activities to be part of its task. It's at the root of the activity stack, but other activities (necessarily "standard" and "singleTop" activities) can be launched into the same task. A "singleInstance" activity, on the other hand, permits no other activities to be part of its task. It's the only activity in the task. 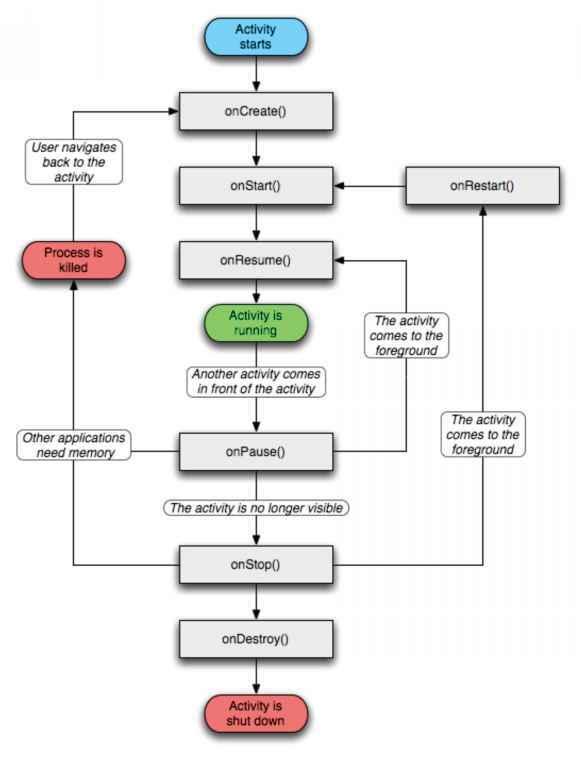 If it starts another activity, that activity is assigned to a different task — as if flag_activity_new_task was in the intent. For more information on launch modes and their interaction with Intent flags, see the Activities and Tasks section of the Application Fundamentals document. A value of "true" means that the activity will not leave a historical trace. It will not remain in the activity stack for the task, so the user will not be able to return to it. The name of a permission that clients must have to launch the activity or otherwise get it to respond to an intent. If a caller of startActivity() or startActivityForResultn has not been granted the specified permission, its intent will not be delivered to the activity. The name of the process in which the activity should run. Normally, all components of an application run in the default process created for the application. It has the same name as the application package. The <application> element's process attribute can set a different default for all components. But each component can override the default, allowing you to spread your application across multiple processes. The default value. The system chooses the orientation. The policy it uses, and therefore the choices made in specific contexts, may differ from device to device. Landscape orientation (the display is wider than it is tall). Portrait orientation (the display is taller than it is wide). The user's current preferred orientation. The same orientation as the activity that's immediately beneath it in the activity stack. The orientation determined by a physical orientation sensor. The orientation of the display depends on how the user is holding the device; it changes when the user rotates the device. An orientation determined without reference to a physical orientation sensor. The sensor is ignored, so the display will not rotate based on how the user moves the device. Except for this distinction, the system chooses the orientation using the same policy as for the "unspecified" setting. If this attribute is not set, the activity inherits the theme set for the application as a whole — see the <application> element's theme attribute. If that attribute is also not set, the default system theme is used. • The state of the soft keyboard — whether it is hidden or visible — when the activity becomes the focus of user attention. • The adjustment made to the activity's main window — whether it is resized smaller to make room for the soft keyboard or whether its contents pan to make the current focus visible when part of the window is covered by the soft keyboard. The state of the soft keyboard (whether it is hidden or visible) is not specified. The system will choose an appropriate state or rely on the setting in the theme. The soft keyboard is kept in whatever state it was last in, whether visible or hidden, when the activity comes to the fore. The soft keyboard is hidden when the user chooses the activity — that is, when the user affirmatively navigates forward to the activity, rather than backs into it because of leaving another activity. The soft keyboard is always hidden when the activity's main window has input focus. The soft keyboard is visible when that's normally appropriate (when the user is navigating forward to the activity's main window). The soft keyboard is made visible when the user chooses the activity — that is, when the user affirmatively navigates forward to the activity, rather than backs into it because of leaving another activity. content of the window has any layout views that can scroll their contents. If there is such a view, the window will be resized, on the assumption that scrolling can make all of the window's contents visible within a smaller area. The activity's main window is always resized to make room for the soft keyboard on screen. The activity's main window is not resized to make room for the soft keyboard. Rather, the contents of the window are automatically panned so that the current focus is never obscured by the keyboard and users can always see what they are typing. This is generally less desireable than resizing, because the user may need to close the soft keyboard to get at and interact with obscured parts of the window.